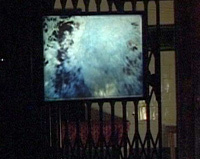 Solo show at Aldwych Underground Station (disused), London, June 2001. 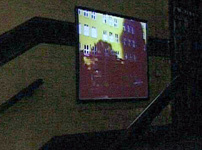 Footage from Berlin 2001, projected into former advertising spaces and in the lift of the underground station. 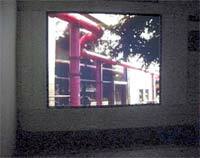 The images are of a temporary groundwater management system in Berlin, consisting of an extensive and highly visible network of large diameter pipes painted pink. This system ran through, across and over many urban sites in Berlin for 8 years to facilitate the development of Potsdamer Square. If one follows one of those pipes to where it leads one arrives, sooner or later, at the Spree, the river which traverses Berlin, and into where the water is pumped, bursting out of its pipes in 3min cycles in exuberant and orgiastic bursts. 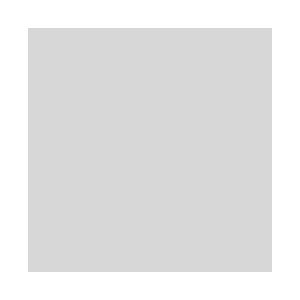 Neither here so below as in tomorrow, video 2001, 2' 30"